Hannah Arendt, a Jewish political theorist who caused a revolutionary stir in political philosophy, was born as Johanna Arendt on October 14, 1906, in Hanover, Germany. Hannah belonged to an underprivileged family, and after the death of her father at a very young age, her struggle with limited financial means intensified. Hannah received her education at various universities, her time spent at the University of Marburg highlights the commencement of her political and radical affiliations, and there she worked with Martin Heidegger for a brief period. Arendt received her doctorate in 1928, from the University of Heidelberg. She conducted her doctoral thesis on Saint Augustine under the supervision of Karl Jaspers. Upon completing her education, Hannah tied the knot with Gunther Stern, and began her involvement in political activism and agitations. Hannah began gathering evidence on the Nazi regime’s anti-Semitic practices. However, the constricting and strict Nazi Party took notice of her activities and Arendt began encountering disturbances. Her difficulties increased and in 1933, she was forced to flee her homeland. Hannah sought refuge in Paris, and there, she began working for the Youth Aliyah, an organization devoted to rescuing impoverished Jewish children from Eastern Europe. In 1940, Hannah remarried, this time to Heinrich Blucher. The anti-Jew movement propagated by the Nazi Party began to gain momentum, and Jews all over Germany began to leave Germany to seek refuge from the brutally oppressive and dehumanizing tactics of the government. Tragedy struck her life, when Hannah and her husband were sent to concentration camp in Gurs, France, however, fortunately, Hannah and Blucher managed to escape the camp, and in 1941, they left for the US. In the USA, Hannah began formulating her experiences in war ridden anti-Jew Germany and the horrors she experienced at the concentration camp in to one of her highly acclaimed and widely discussed work, ‘The Origins of Totalitarianism’, which she published in 1951. Through this book, she provided an in depth analysis into the autocratic and oppressive regimes of Adolf Hitler and Joseph Stalin. Her fame began to spread, and she became known as a prominent philosopher on Jewish affairs in the post-World War II society and totalitarianism. In 1951, Arendt received her US citizenship. In 1958, she published another groundbreaking philosophic masterpiece, ‘The Human Condition’, she had found the inspiration for this work from Ancient Greek culture, and sought to critically examine the boundaries and limitations of the modern world. In this book, Hannah dealt with the human aims and struggles to work, act and labor, and she examined how these aims and struggles made an impact on four crucial facets of life: Social, private, public and political. In 1961, she was selected by the New Yorker magazine as a reporter to cover the scandalous trial of Nazi war criminal, Adolf Eichmann, held in Jerusalem. She published her observations of the trial in 1963, entitled ‘Eichmann in Jerusalem: A Report on the Banality of Evil’, in which she portrayed Eichmann as a brutally ambitious bureaucrat who put no value to human life in pursuit of him ambitions. She also began conducting lectures at the University of Chicago and Princeton. In 1967, Arendt was offered the position of a professor of philosophy at the New School for Social Research, located in New York. Hannah continued writing and observing political scenarios and in 1972, she published yet another remarkable work, ‘Crises of the Republic’. She also did ample research on the cognitive abilities of the human body to think, perceive and act, she began compiling a trilogy entitled, ‘The Life of the Mind’, in which she divided her cognitive examination in three parts: Thinking, willing and judging. However, tragically Hannah did not live long enough to finish the three-volume book, as she passed away on December 4, 1975, due to heart failure. 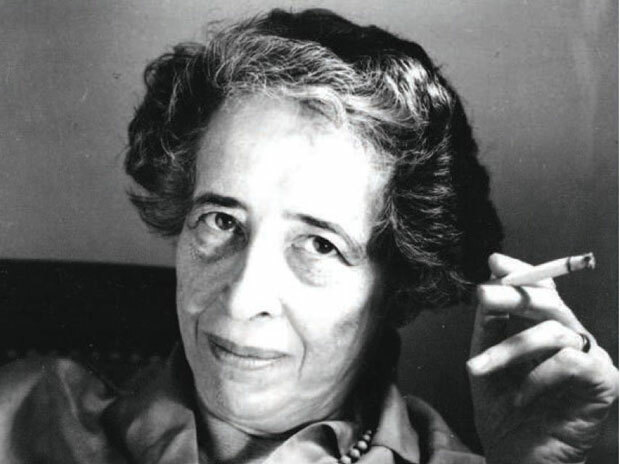 Hannah Arendt has made several significant literary contributions that continue to influence the masses to this day. Some of her highly acclaimed works include ‘Between Past and Future’, ‘Eichmann in Jerusalem: A Report on the Banality of Evil’, ‘The Human Condition’, ‘The Jew as Pariah: Jewish Identity and Politics in the Modern Age’, ‘The Life of the Mind’, ‘Men in Dark Times’, ‘On Revolution’, ‘The Origins of Totalitarianism’ and ‘Rahel Varnhagen: The Life of a Jewish Woman’. Most of her collection of books and essays are kept at the New School for Social Research, which also runs the Hannah Arendt Center for Politics and Humanities as a tribute to her legacy.